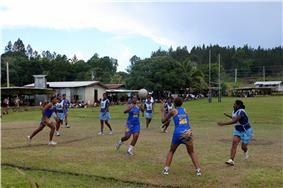 Netball is most popular in Commonwealth nations, specifically in schools, and is predominantly played by women. 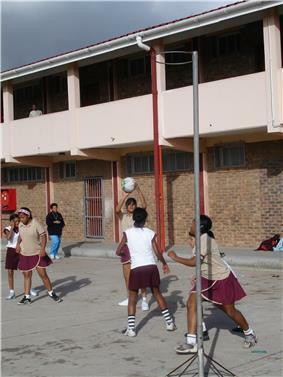 According to the INF, netball is played by more than 20 million people in more than 80 countries. Major transnational competitions take place, including the Netball Superleague in Great Britain and the ANZ Championship in Australia and New Zealand. Three major competitions take place internationally: the quadrennial World Netball Championships, the Commonwealth Games, and the yearly World Netball Series. In 1995, netball became an International Olympic Committee recognised sport, but it has not been played at the Olympics. The World Netball Championships have been held every four years since, most recently in 2011. 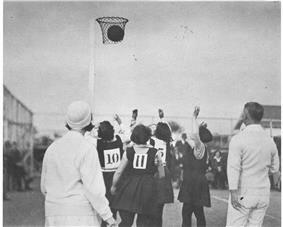 The World Youth Netball Championships started in Canberra in 1988, and have been held roughly every four years since. In 1995, the International Olympic Committee designated netball as an Olympic recognised sport. Three years later it debuted at the 1998 Commonwealth Games in Kuala Lumpur. Other international competitions also emerged in the late 20th century, including the Nations Cup and the Asian Netball Championship. As of 2006, the IFNA recognises only women's netball. Men's netball teams exist in some areas but attract less attention from sponsors and spectators. Men's netball started to become popular in Australia during the 1980s, and the first men's championship was held in 1985. In 2004, New Zealand and Fiji sent teams to compete in the Australian Mixed and Men's National Championships. 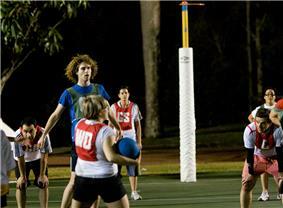 By 2006, mixed netball teams in Australia had as many male participants as rugby union. Other countries with men's national teams include Canada, Fiji, Jamaica, Kenya, Pakistan and the United Arab Emirates. Unlike women's netball at elite and national levels, men's and mixed gendered teams are largely self-funded. Each team is allowed seven players on the court. Each player is assigned a specific position, which limits their movement to a certain area of the court. A "bib" worn by each player contains a two letter abbreviation indicating this position. Only two positions are permitted in the attacking shooting circle, and can therefore shoot for a goal. Similarly, only two positions are permitted in the defensive shooting circle; they try to prevent the opposition from shooting goals. Other players are restricted to two thirds of the court, with the exception of the Centre, who may move anywhere on the court except for a shooting circle. Indoor netball is a variation of netball, played exclusively indoors, in which the playing court is surrounded on each side and overhead by a net. The net prevents the ball from leaving the court, permitting faster play by reducing playing stoppages. The World Series is a competition among the top six national netball teams, as ranked by the UK Sport, and the host city's local council. The All England Netball Association covers air travel, accommodation, food and local travel expenses for all teams, while the respective netball governing bodies cover player allowances. It is held over three days, with each team playing each other once during the first two days in a round-robin format. The four highest-scoring teams advance to the semi-finals; the winners face each other in the Grand Final. The competition features modified fastnet rules and has been likened to Twenty20 cricket and rugby sevens. A new format featuring shorter matches with modified rules was designed to make the game more appealing to spectators and television audiences. The World Netball Series was held annually in England from 2009 to 2011. Netball's important competition is the World Netball Championships, held every four years. 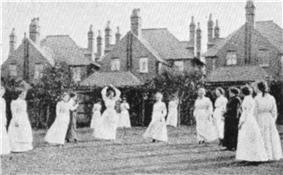 It was first held in 1963 at the Chelsea College of Physical Education at Eastbourne, England, with 11 nations competing. Since its inception the competition has been dominated primarily by the Australian and New Zealand teams, which hold ten and four titles, respectively. Trinidad and Tobago is the only other team to win a championship title. That title, won in 1979, was shared with New Zealand and Australia; all three teams finished with equal points at the end of the round robin, and there were no finals. There are three major international netball competitions. The ANZ Championship is a Trans-Tasman competition that has been broadcast on television in both New Zealand and Australia since 2008. It is contested among ten teams from Australia and New Zealand. It began in April 2008, succeeding Australia's Commonwealth Bank Trophy and New Zealand's National Bank Cup as the pre-eminent netball league in those countries. The competition is held annually between April and July, consisting of 69 matches played over 17 weeks. 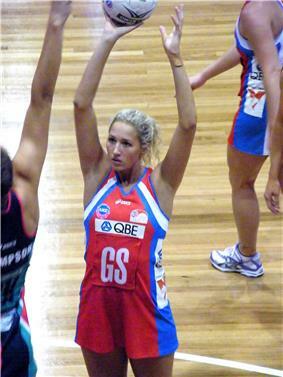 The ANZ Championship saw netball become a semi-professional sport in both countries, with increased media coverage and player salaries. The American Federation of Netball Associations (AFNA) hosts two tournaments each year: the Caribbean Netball Association (CNA) Under 16 Championship and the AFNA Senior Championship. The CNA championship involves two divisions of teams from the Caribbean islands. In 2010 five teams competed in two rounds of round robin matches in the Championship Division, while four teams competed in the Developmental Division. Jamaica, which has lost only once in the tournament, decided not to play the 2011 tournament. The AFNA Senior Championship includes Canada and the USA along with the Caribbean nations. The tournament serves as a qualifier for the World Championship. Jamaica, with its high ranking, does not have to qualify; this leaves two spots to the other teams in the tournament. 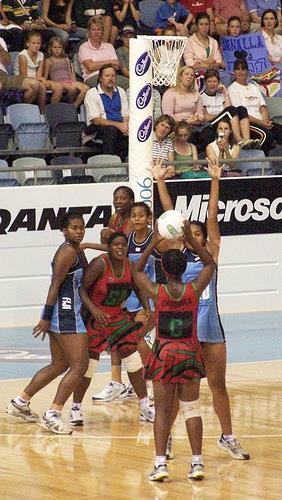 Netball was one of three new sports included in the 1998 Commonwealth Games and has been a fixture ever since. Twelve teams competed there in 2010. Australia and New Zealand have won two golds and two silvers each, while England has three bronzes and Jamaica one bronze. Each region has an IFNA Regional Federation.As of July 2012, the IFNA has 49 full and 24 associate national members in five regions.